OhGizmo! 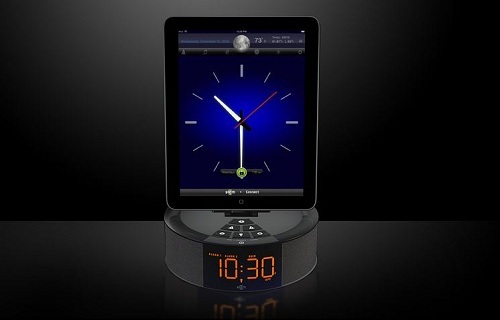 Review – Stem TimeCommand iPhone/iPad Dock | OhGizmo! In addition to the dock itself, there is a free app for controlling your alarms. It also has other features such as displaying the current weather, letting you fall asleep to ambient sounds/music and waking up via the bedside lamp. Usually the first thing I do when plugging in a clock is program it. While it does give you the ability to manually set the time, you needn’t bother on the TimeCommand. Once you dock your iOS device, it will automatically sync the time with it. This is a feature that I’d love to see on every iPhone dock. Now actually docking the phone is something I’m not terribly fond of with this product. In order to accommodate all of the iOS devices, whether they are in a case or not, isn’t an easy task. What Stem has done is made a dock connector that pivots outward, which does indeed make it able to hold just about any device. The problem is that when nothing is plugged in, it moves back to its original position, via a spring. Therefore you’ll need two hands to place your iPhone in its cradle for the night (one to hold the phone, the other to position the dock connector properly). Since I only use this for a single phone, it would be nice to have the ability to lock the connector in place, so I can just set down my phone and not have to fiddle with the connector. Now aside from using the light button, you probably aren’t actually going to touch the dock for any reason. This is because everything else can be controlled with the Stem:Connect app. To be perfectly honest, you probably won’t use a lot of the features in this app, either. Things like displaying the time, messing with the EQ of your music checking the weather don’t really serve much of a purpose. Yes, seeing how warm it is when you first wake up is nice, but if I’m really concerned about the weather, I’m probably going to use a dedicated app that has more features and details. What you’re going to be most concerned with are the core features of this app. These are the alarms, and the “sleep to audio” mode. I like being able to go to sleep with some sort of ambient noise playing, or even music, so I enjoyed this feature. You can select any number of songs from your phone’s music library and set just how long you want it to play. There is also the option of choosing a nature sound to play instead. 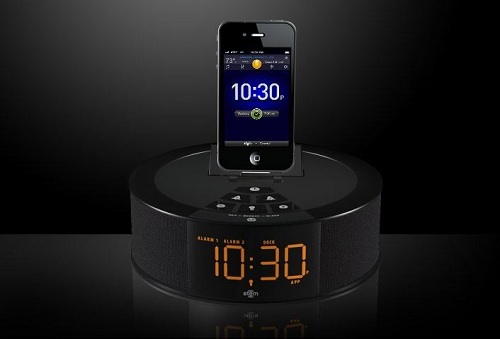 Once this is set, the phone will dim and play your music until the time is up. At that point, it will simply fade out the music. I’m usually not one to get very excited about alarms, but this is the first dock that I’ve actually been able to rely on the built-in software to wake me up. See, the trouble with using alarm software other than the one built into the phone is that you need to keep the app open for it to work. If the app is closed, the alarm will never go off. So what makes this software any different? Well, remember how I told you earlier that the dock automatically synced the time with your phone? It does the exact same thing with your alarms. Whenever you program an alarm on the app, the dock will receive them as well. If you accidentally close out of the app, or take your phone off of the dock, the alarm will still go off on the dock itself. It’s this sort of backup plan that makes this software and dock combo reliable. As for listening to music, this device is pretty middle-of-the-road. It’s good enough for listening to music while you fall asleep, but I wouldn’t exactly use it for my primary set of speakers. The Stem TimeCommand might not be the most feature-rich dock in the world, but it has become my favorite. From the little things like syncing the time and letting you turn on/off a bedside lamp to having a failsafe alarm, this dock has it where it counts. For the price of $100, it might be a little more on the expensive side than I’d like, but it does live up to the cost. ← Go, Receipt Racer, Go! We bought one for Christmas and are taking it back. POC The light turns on too fast, then turns off when you hit the snooze! You have to turn down the iPad screen brightness every night otherwise it illuminates the entire room. This was not ready for release.